When Michael Browning was in seventh grade, he decided to give the track and field team a try. Since he was one of the biggest seventh graders at 6-foot-1, 220 pounds, coaches figured the shot put would be a good event for him. 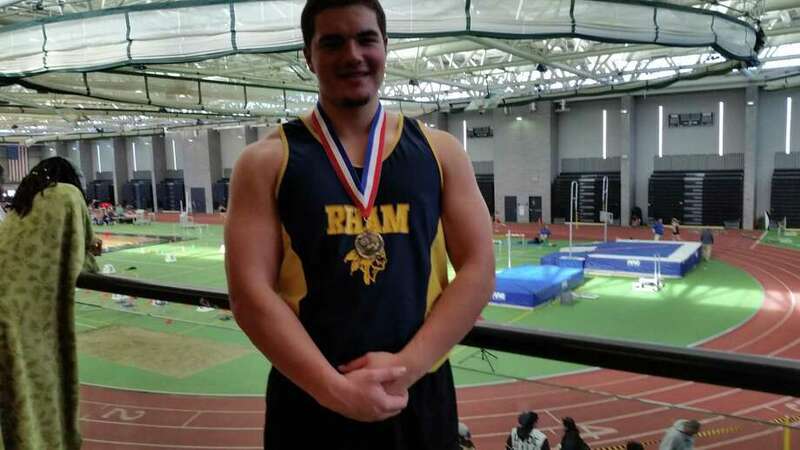 Then he entered his freshman year at RHAM, competed in the shot put for the high school team and at first things weren’t so great. “In my freshman year, I wasn’t great any more,” Browning said. “In high school there were a lot of guys as big or bigger than me and stronger when I was a freshman. I was determined to get better, so the summer before my sophomore year I started working with a private coach, Damien Larkins. He’s the track coach at Bloomfield and gives private lessons. Browning’s development improved and as a junior in last season’s indoor track and field season he won the shot put at the CIAC Class M meet (56 feet, 7.75 inches) and State Open meet (53-3.25). Earlier this indoor season he was ranked in the top five in the nation in the shot put. On Saturday (Jan. 26), he kicked off the 2019 postseason by winning the shot put (58-0.25) at the CCCmeet at Floyd Little Athletic Center in New Haven. He also holds the school record for the shot put (59-6.5) set in the 2018 indoor season. He is the top seed in Friday’s Class L meet. While working out with Larkins has paid big dividends for Browning, hard work has been another big reason for his success. “I do an obscene amount of hard work every day, I’m lifting weights 4-6 hours a day,” Browning said. “It is really necessary in order to progress, develop and maintain my success. I practice at school, with my private coach when I’m with him on Thursday from 7 p.m. to 9 p.m. and when I’m home. Browning’s goal is to be an All-American in the shot put and weight throw this indoor season and an All-American in the shot put, discuss and hammer throw in the outdoor season. He plans to throw the shot put in college and had a visit last week at Kentucky. Another consideration is Iowa State. “I’m sure Michael will do well at the next level,” Fogarasi said.